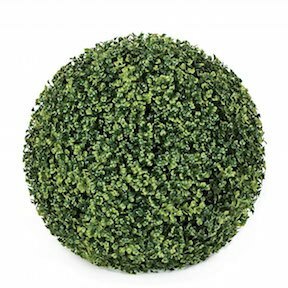 15 Inch Polyblend Plastic Boxwood Outdoor Topiary Ball is a beautiful addition on your Deck or Poolside with the sun shining on it's shaded leaves. This 15 inch artificial boxwood ball makes for a stunning addition to any outdoor yard, whether green or paved. Do you enjoy the look of topiary specimens, but don't want the hassle of caring for live plants? This boxwood ball has all of the charm and beauty of natural boxwood, with virtually none of the mess, fuss, or expense of growing and training a live topiary! This artificial boxwood ball makes decorating with topiaries a breeze. Regardless of how dry, poorly-drained, or shady a yard is, this topiary will keep looking lush and green day in and day out. Its realistic look and ease of maintenance make it the perfect way to dress up bland, unplantable yard spaces, like wooden or concrete decks. This topiary will never need to be trimmed or shaped, will never need watering or sunlight, and can easily be moved from one location to another without the hassle, expense, or hazards of transplanting a live shrub. Because of this piece's shape, it can be used either with a container or without. For a stunning decorative piece, simply place inside your favorite decorative planter. It also makes for an interesting focal point when left loose alone or grouped with other topiary specimens. Best of all, it's also extremely affordable when compared to live boxwood, even before the ongoing costs of fertilizer and other soil amendments. Live boxwood is slow growing, and the years it takes to raise a specimen are often reflected in its price. Natural boxwood makes for lovely topiaries, but it isn't an ideal addition for a lot of yards or gardens-- especially for novice topiary gardeners. If you have a difficult-to-plant yard, poor soil, or a large paved area that could use some attention, then this 15 inch artificial boxwood ball topiary may be the ideal solution for you.